A new secret has been uncovered from the depths at the North Carolina Maritime Museum in Beaufort. And no, it’s not the infamous Queen Ann’s Revenge. It is a new exhibit that lets visitors take the drop into North Carolina’s rich surfing past and ride the wave through its incredible historical journey to becoming a cultural and economic staple of the coastal community. When people picture crashing waves, patterned boards and colorful swim gear, they often imagine tropical getaways like Hawaii or the Caribbean, or far-off coastal locations in Florida and New Jersey. However, North Carolina’s crystal coast has nurtured a nautical secret—a surfing tradition over a century old. There exist records of surfing on North Carolina’s coast dating back to the first decade of the twentieth century, the same time as a surfing revival in Hawaii. 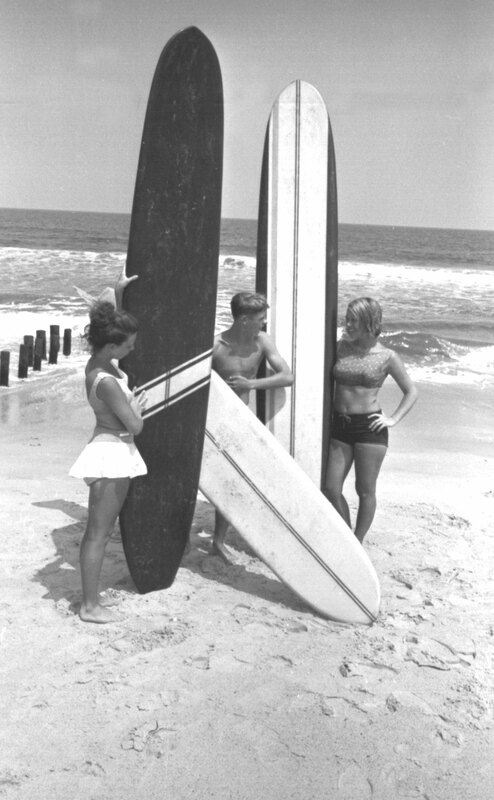 Then, surfboards were plain, long swaths of wood, often used for practical transportation and, on occasion, recreation. With influence from Hawaiian surfers and the growing popularity of surf culture in television and film, many of North Carolina’s coastal towns grew into burgeoning surfing communities that are alive and well today. The treacherous tides and sneaky sandbars of North Carolina’s coast have drawn wave junkies and fans to places like Rodanthe, Cape Hatteras, Atlantic Beach, Wrightsvillle Beach and more for decades. After nearly a century of sport, it is clear that surfing in the Crystal Coast is more than just a passing fad. The craft is surely here to stay, with North Carolina ranking as one of the most popular states for surfing. “It’s unbelievable that North Carolina has such a massive surf following that has gone majorly unexamined,” said David Cartier, public relations coordinator for the North Carolina Maritime Museums. “Up until last month, people could sit in the sand or take to the waters themselves to observe it. Now, they can come to the museum, too. Our new exhibit offers a dynamic look at how surfing shaped the North Carolina coast and its culture that will fascinate parents and kids alike,” Cartier said. Surfing, surf shops and the tourism that they created have encouraged economic growth on both local and state levels for decades with no signs of stopping. The exhibit features photos, videos and artifacts that document surfing history in eastern North Carolina. Visitors can observe the evolution of surfboards from plain, wooden slabs to the sleek, colorful boards that ride today’s waves. They can watch video of North Carolina’s greats shredding just off the beach, see pictures of historic surfing landmarks and look at various surfing getup from days past. 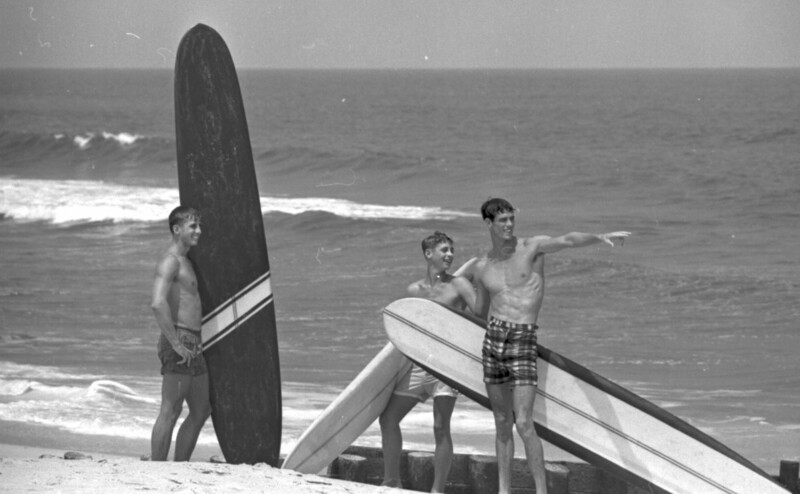 Photo Credit: A group of young surfers in Kure Beach, Hanover County, NC, on July 25, 1965. Photo from The News & Observer. When one thinks about the words history and surfing together, the mind may conjure up images of surfers challenging the big waves off Hawaii, or perhaps even of Samoans or Australians riding a lonely beach in the remote Pacific. Then, when one considers the famous surfing locations along the East Coast of the United States, one might dream up images of Cocoa Beach, Florida or Atlantic City, New Jersey. One might not be inclined to include North Carolina among such hallowed surfing locales. But that would be a mistake. Although it is impossible to determine who rode the first wave or made the first surfboard at any of these places, we do know that surfing has been taking place in the Old North State for more than a century. As coastal economies shifted to more tourism and recreation based businesses and people began to afford more free time for travel and leisure, sports like surfing gained popularity along the Carolina shore. Who would have guessed that people would be trying such an odd activity as riding a wave toward the sand on a wooden plank at places like Wrightsville Beach or Kitty Hawk. As a matter of fact, it was eventually discovered that the beaches of the outer barrier islands produced some of the best waves on the eastern seaboard, spawning a sizeable industry of surfboard shapers and surf shops in North Carolina, not to mention producing some very talented competitive surfers as well. In the summer of 2013, we began making plans for a special program and exhibit detailing the history of surfing along the coast of North Carolina. There have been some really good localized efforts to chronicle the history of the sport, such as Peter Fritzler’s work with the Cape Fear Surfing Archive at the University of North Carolina in Wilmington, but there was as yet no effort to investigate the story of surfing as it relates to the state as a whole. None can argue that surfing is a quintessential maritime activity. We therefore set out to see what we could find that was pertinent to our project. To accomplish this, it was necessary that we begin assembling documentation from a variety of sources to learn as much as we can about the history of surfing here in North Carolina. In addition to the traditional primary sources such as photographs, magazines and newspapers, it became evident that there are still many people alive today who were instrumental in the growth of the sport in the second half of the 20th century. So part of the effort has been to contact these people to find out firsthand what they recall about certain aspects of the sport. We also set out to try to determine as close as possible at what point in time surfing came to North Carolina. Stories abound of surfers travelling down from Virginia and New Jersey looking for waves to ride, and discovering that the beaches along the Outer Banks produced some of the best waves on the East Coast. Meanwhile, further down the coast in Onslow County, military personnel and their families were surfing at Onslow Beach. Most of this wave of surfers began moving down into the area in the 1950’s and 1960’s, when surfing began to capture the national imagination thanks to movies, music and television. What we have found is that the sport of surfing has roots much deeper in North Carolina’s past, and was practiced at an earlier date than most folks realize. As of now, we cannot say unequivocally that surfing along the East Coast of the United States started in North Carolina, any more than other locales in the region can make the same claim. We do know that surfing along the North Carolina coast was being practiced at least as far back as the first decade of the 20th century, which makes it coeval with the point in time when surfing, which had nearly died out, was undergoing a revival in Hawaii. There are also some intriguing hints that surfing in North Carolina predates the famous surfing exhibitions of George Freeth in California in 1907, which many acknowledge as the birth of the sport along the West Coast of the United States. 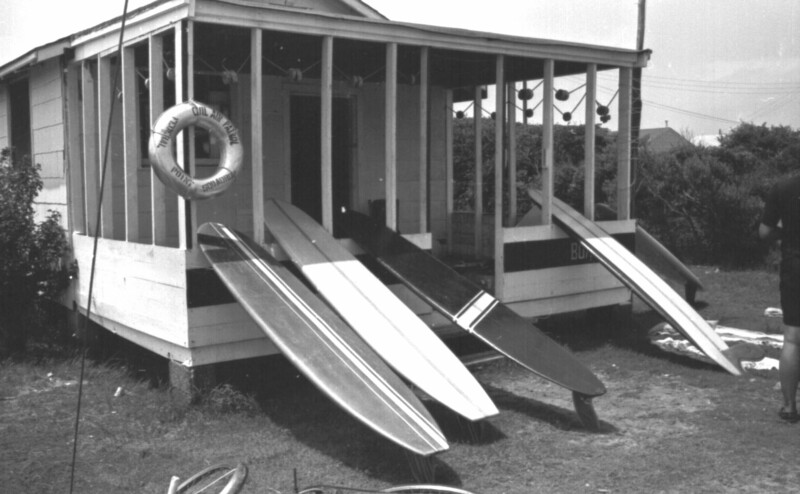 Our research has uncovered some long forgotten surfing pioneers from North Carolina. For instance, Burke Bridgers of Wrightsville Beach and several of his friends were experimenting with surfing techniques there off Wrightsville Beach as early as 1909. We know this thanks to a letter Bridgers penned to Alexander Hume Ford, a South Carolinian who was a major contributor to the survival and spread of the sport from Hawaii. 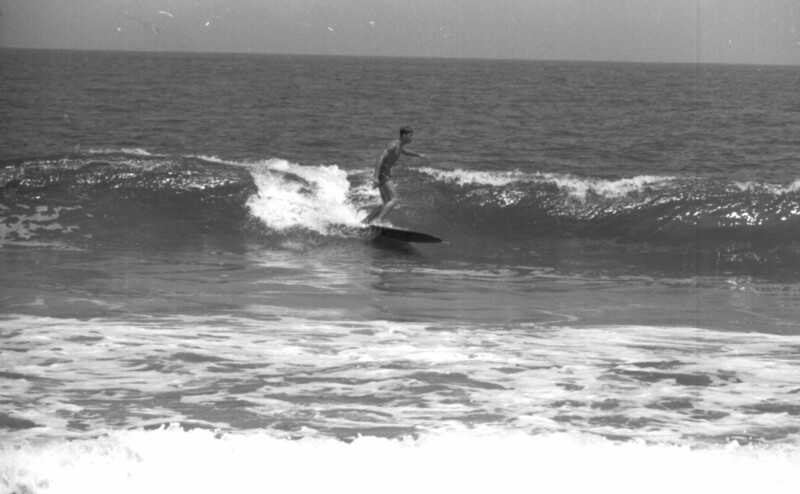 Bridger’s activities along the Cape Fear Coast are being investigated today by Skipper Funderburg, a surfing pioneer in his own right who has spent much time and effort tracking down the history of the sport in the Wilmington area. Although we have so far not found any other North Carolina surfing activities that predate Bridgers and his associates at Wrightsville, we have been able to establish the fact that surfing was being practiced along the Outer Banks much earlier than previously thought. For instance, we know that surfing was taking place at the resort hotels of the southern Outer Banks in the vicinity of Morehead City and Beaufort as early as the summer of 1911. 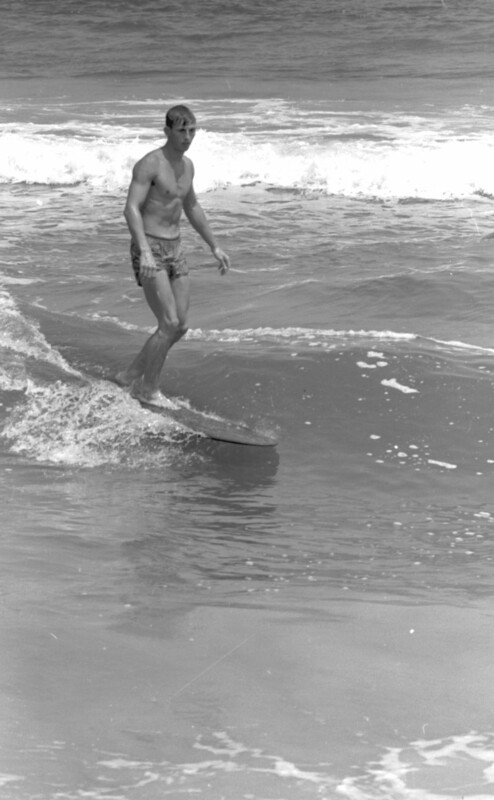 A few years after Kaiama and his troupe were putting on their surfing demonstrations, another individual was experimenting with surfing along the northern Outer Banks. Thomas Fearing of Manteo is credited by historian David Stick as being one of the earliest surfers in that area. Stick noted that Fearing built a Hawaiian-type surfboard that was capable of carrying two people. Whether Fearing, who practiced his surfing in the 1930’s, was influenced by Kaiama, is unknown at the present. Unfortunately, Fearing’s surfing activities were cut short by the onset of World War II and his subsequent death when his Grumman Hellcat crashed in the South Pacific in April of 1944. 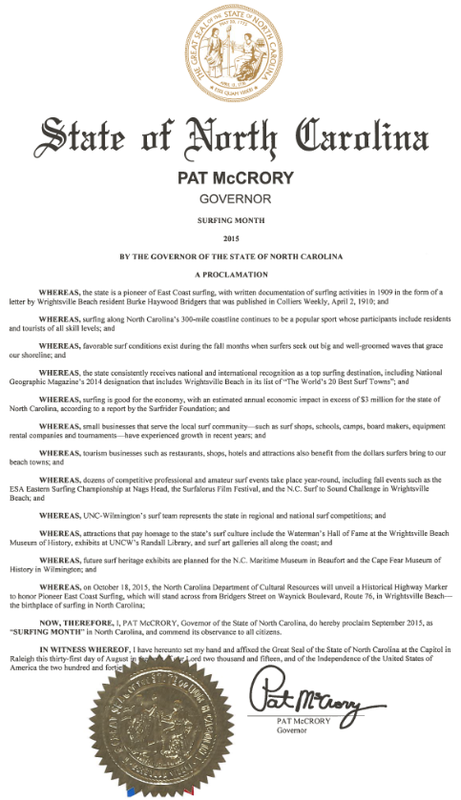 The sport of surfing grew from these early efforts, and over the past hundred years there have been some notable achievements in the sport in North Carolina. 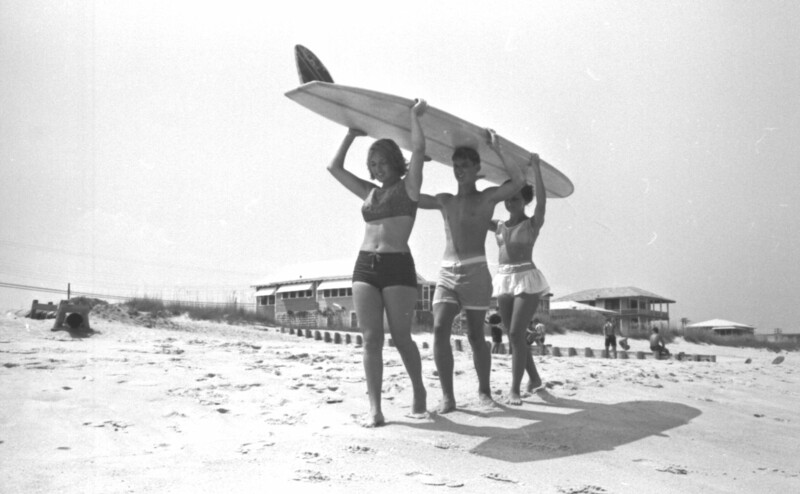 Organized surfing contests began as early as 1965 in Wrightsville Beach. The First Annual North Carolina Invitational Tournament was held at Atlantic Beach in June of 1967. The East Coast Surfing Association’s Championship, which eventually became known as The Easterns®, was first held at Cape Hatteras in Dare County in September of 1971. A contest called the East Coast Wahine Championship of Surfing specifically designed for female surfers was first held at Wrightsville Beach in August of 1997. Today surfing has grown into a popular pastime that generates billions of dollars annually for coastal communities. No longer do the stereotypes apply of anti-social surfers shirking family and professional responsibilities just to focus on the next big swell. Surfing has become as much a recognized sport as other independent activities such as golf or skiing. Surfers of today include doctors, lawyers, police officers, scientists, artists and many more walks of life. A 2007 article in the New York Times estimated that nearly two million people in the United States consider themselves active surfers and a 2011 report by Surf-First and the Surfrider Foundation discovered that out of the top seven most surfer populated states in the country, North Carolina’s surfers ranked the highest in percent employed. This translates to big dollars especially when you include the sale of merchandise to non-surfers and lessons for first timers. Surfing apparel alone represents annual sales in the $8 billion + range in the global economy. The 2011 report estimated the average spent on a surfing excursion in the United States, that is, a one-time trip to a somewhat local beach, was $66 per visit. This would lend an additional $36 million annually to the equation. That same report reveals that the average expenditure per visit in North Carolina is $111, contributing over $3 million to the state’s economy every year. All the more reason to recognize the importance of the sport from a historical and cultural standpoint considering the role it has and continues to play in the state’s economy.